With AER: Memories of Old, developer Forgotten Key achieved something few games have managed in the past: making players feel as though they can actually fly. While other games have allowed their heroes to take to the skies, few have ever made soaring through the clouds feel as effortless and genuinely pleasurable as the experience on offer here. 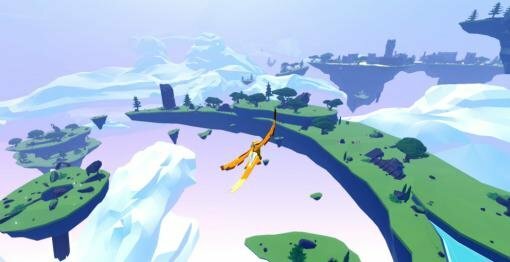 With just a few quick button presses, the young protagonist can transform into a bird and loft herself airborne, gliding between gorgeous low-poly floating islands with remarkable ease. You can practically feel the wind in your face, your stomach rising and falling with every swoop, climb, bank and landing. Perfectly complemented by user-friendly controls that help bring this breathtaking sensation to life, AER's fluid flight mechanics went a long way toward securing this game our Best Animation award. Unlike many flight sims, navigating the open space here is surprisingly simple, making you wish the entire game took place high above the ground. Plan to spend far longer than is actually necessary traversing between islands, opting for the long way around just to stretch each trip out a little bit longer. Thankfully, the animation is just as appealing on terra firma, as you stumble upon the various wildlife populating this fantastical world. Getting one of these adorable little animals to fall in love with you is just one of the memorable highlights. And within the puzzle-laden temples, ever in motion is the heroine herself, as she runs, jumps, and climbs her way from one platforming obstacle to the next. While the controls here may not be nearly as forgiving, the action is never less than a joy to behold. And then, back to the skies! If there’s one area where adventures games routinely fall short, it’s animation. Usually we’re lucky to get an intro cinematic, a few ambient effects, and some rough-around-the-edges character interactions playing out on-screen. What a treat, then, to get so many worthwhile competitors this year. 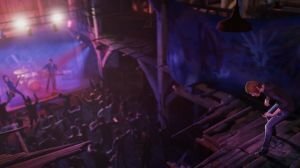 Perhaps it’s no surprise that the top two are among the biggest-budgeted games of the year, but the artists still needed to deliver, and in Life Is Strange: Before the Storm, developer Deck Nine did just that, offering fluid and realistic character animation with a rich abundance of environmental detail in motion. From the most hectic moments, such as Chloe jamming on air guitar in the rafters far above a driving rock concert, to the most serene, like a peaceful afternoon at the railway tracks overseen by twittering birds and skittish squirrels, for adventure fans this is the next-closest thing to a cinematic CG movie – and it had to be, to beat out some impressive runners-up.